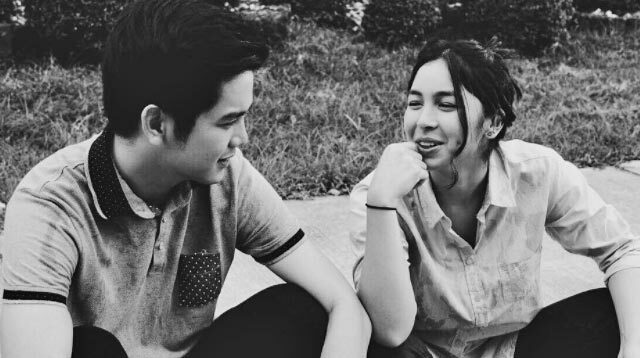 It looks like Julia Barretto and Joshua Garcia are getting closer to becoming ~*official*~! Aside from Julia Barretto admitting on Tonight With Boy Abunda that Joshua Garcia is the only suitor she is entertaining and that she is also the only girl he is courting, Julia admitted during the A Love to Last press conference on August 29 that she would choose Joshua over her on-screen partner on the show, matinee idol and actor, Ronnie Alonte (Julia and Ronnie play on-screen sweethearts, Chloe and Tupe, in ALTL). "I’m going to have to pick Joshua because Ronnie has a different 'love to last,'" said the actress cheekily during the press con, which caused the rest of the cast to laugh out loud. Ronnie has been rumored to be dating actress Loisa Andalio off-screen which he has yet to confirm. Julia has also said in previous press junkets that she is more comfortable working with Joshua whom she has admitted to be dating, aside from him courting her. Joshua confessed as well that he gets jealous sometimes with Julia’s on-screen partners on A Love to Last. JoshLia’s film Love you to the Stars and Back (LYSB), directed by hugot queen Antoinette Jadaone, is showing on August 30 in cinemas nationwide.